LG has revealed several aspects of its forthcoming flagship phone, the V40 ThinQ, in a promotional video shared in its home market of Korea. The main points revealed by the video are the V40 ThinQ's 6.4-inch screen and five-camera array. LG says it has reduced the bezels as much as possible, allowing the V40 ThinQ to boost the size of the screen compared to the V30/35 while keeping the phone's dimension's in check. Based on visuals shared in the video, the V40 has three cameras on the rear and two cameras on the front. The phone features a metal-and-glass design, with glass on front and back. LG says the rear panel, in particular, has been sand-blasted for smoothness and resistance to scratching and fingerprints. Other aspects of the phone include a rear-mounted fingerprint reader. LG plans to more fully announce the phone at an event in New York City on October 3. LG's latest flagship includes five cameras to offer the widest-possible range of capture capabilities. The V40 ThinQ also features a gorgeous display, sultry materials, class-leading specs, and quick access to Google Assistant and Google Lens. LG today fully revealed the V40 ThinQ, its camera-focused flagship phone for the remainder of the year. The V40 adopts five cameras, with three on the back and two on front. 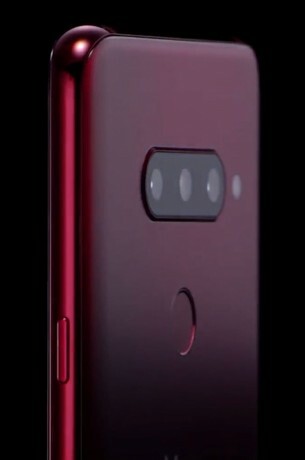 LG today revealed that its forthcoming flagship, the V40 ThinQ, can capture cinemagraphs. The feature, called Cine Shot, lets people record several seconds of video and then create a still image that has a moving segment.